I know, I know. 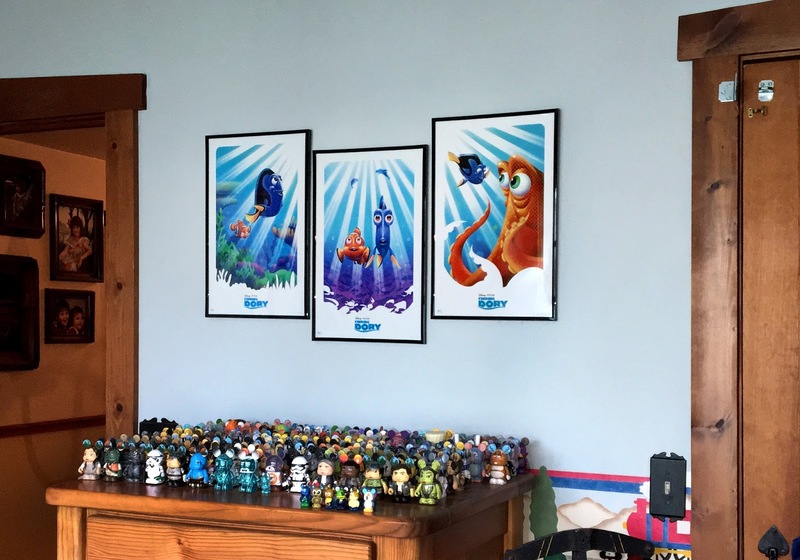 I have a lot of Pixar mugs. I can't resist them though! 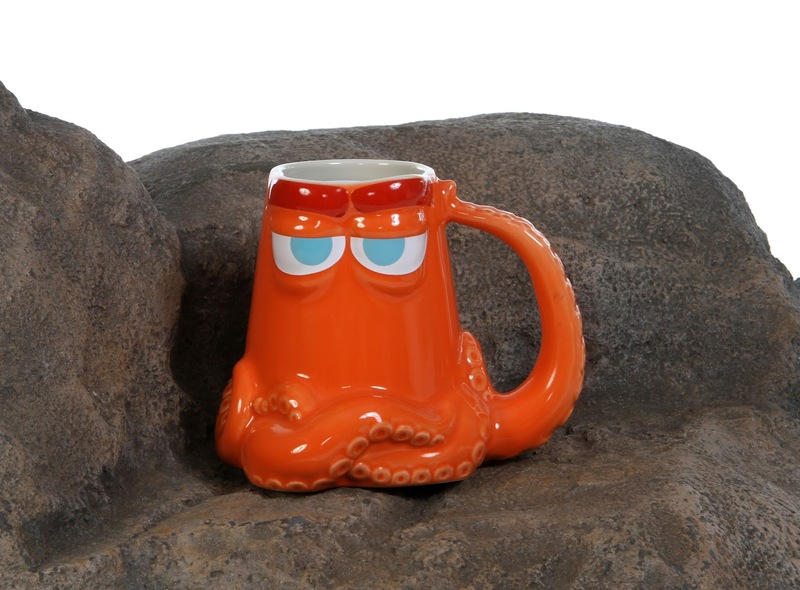 This sculpted Finding Dory Hank mug is especially fantastic and was a must have for me as soon as I saw it back in April (even before I knew he would be such an awesome character). Hank here is 4 3/4' H x 6'' W x 5'' D in size and holds about 16 oz. of your favorite hot beverage (hot chocolate all the way for me). 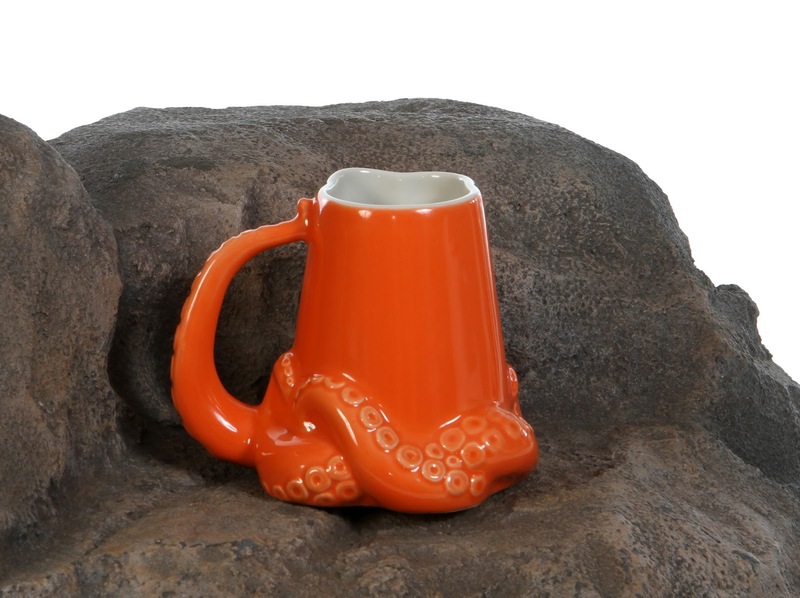 This is a brilliantly designed, well crafted ceramic mug. I love how his tentacle bends to form the handle and his little suction cups add a nice level of detail. His overall look and vibrant colors makes this a must have for any Hank fan. Note- this is both dishwasher and microwave safe. We have reached the third and final part of my Finding Dory Swigglefish collection. 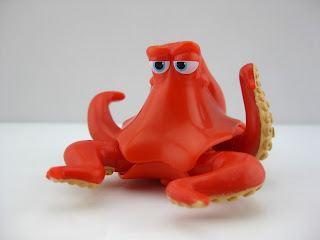 If you missed my previous posts, check out PART 1 HERE (for more on the Swigglefish figures themselves) and PART 2 HERE (for more on the Hank Truck playset). 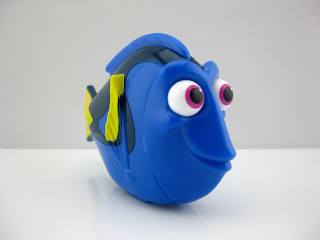 Today I'm showing off this Swigglefish Mr. Ray 3-in-1 carry case/plasyset from Bandai Toys! This thing is so cool and a must have if you're into this collection. 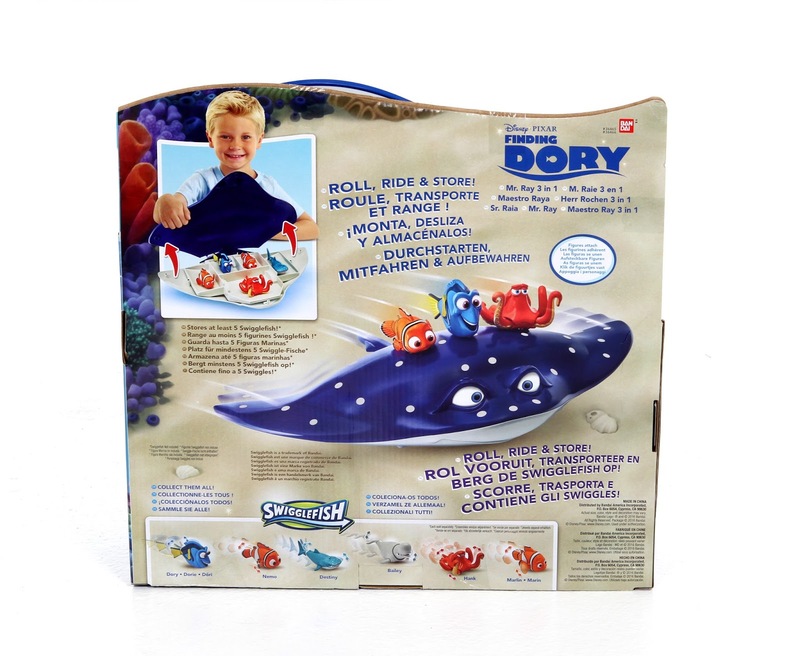 This plastic Mr. Ray is about 16" wide and 17" long, has wheels on the bottom for rolling action, has magnets on top to attach up to three Swigglefish at a time and opens up to be a storage container. Retail is $19.99 and all figures are sold separately. I have to say, this really is a lot of fun. The rolling feature is incredibly smooth and I found out that there is plenty of space inside to store all nine characters comfortably (even though the package states "up to five"). Like with any of the Swigglefish toys, pictures don't really do this justice. So, I decided to make a full video showing this, the figures themselves and the Hank playset in action! Look for that right here tomorrow morning. In the mean time, you can pick this up at really any mainstream store such as Target, Walmart, Toys R Us, etc. or find it on Amazon using the direct link below. 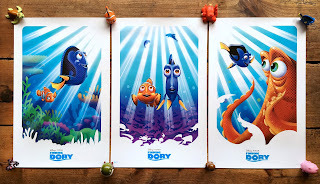 Whether you're a kid or a kid at heart, if you're a collector of Finding Dory, I highly recommend picking this (and all the Swigglefish) up. It's a necessity if all your fish are going to make it to Mr. Ray's class at the drop off on time. A big thanks to Bandai for this fantastic collection! UPDATE- You can now watch my YouTube video below to see this whole assortment in action. Released last summer for a limited time, here we have a unique item that not a ton of people know about...this officially licensed Toy Story inspired Pizza Planet wallet! 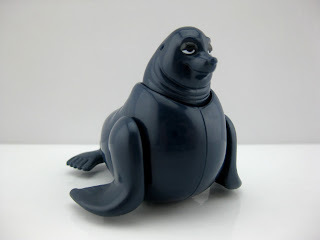 I missed out on this the first go-around last year and had been looking for it to come back in stock for a long time. I was thrilled to have gotten it for my birthday this past month. 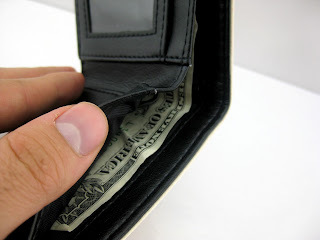 This is a light weight bi-fold wallet made from some kind of faux leather material. Whatever it is, it seems to be nicely made and pretty sturdy in quality. It's made to look a bit grungy and worn, so don't worry, those aren't real pizza stains on there. Original retail price was $20. 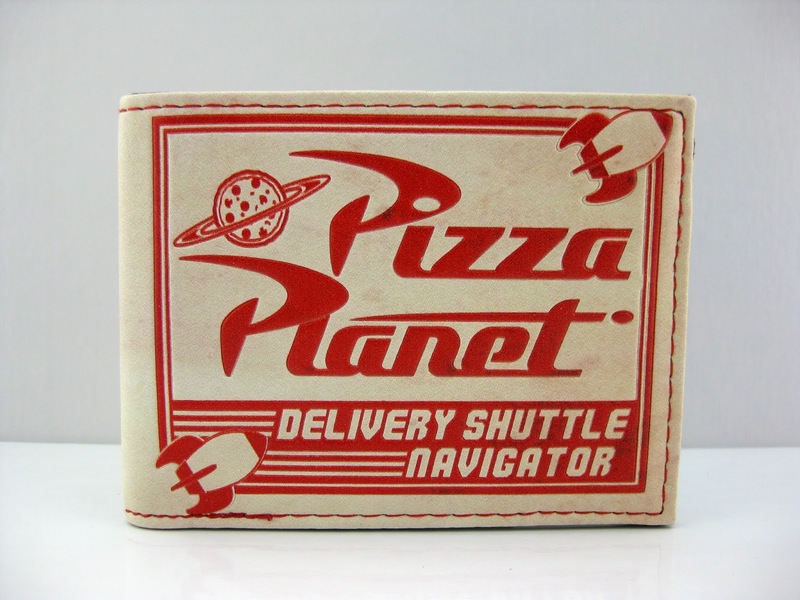 On the front it reads "Pizza Planet Delivery Shuttle Navigator" and features the restaurant's iconic logo. 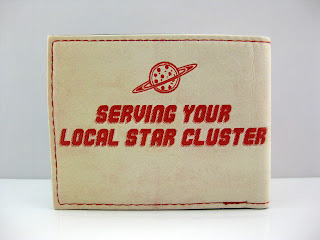 On the reverse side it says "Serving Your Local Star Cluster." 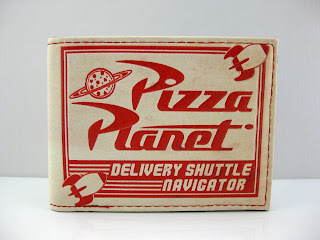 It looks like it could have been in the Pizza Planet shuttle driver's pocket for years, but I think that's exactly what the makers were going for. I'm all about the distressed look. I love it! 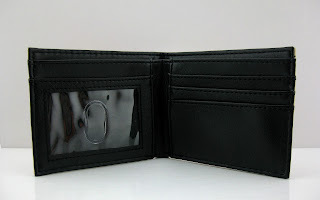 I'm use to my tri-fold wallet, but there's still a decent amount of room here for your license, cards and cash. The pockets seem a bit tight, but maybe they'll loosen up with use. Overall, this is a fun, very cool looking item. However, if you're looking for an actual, high quality leather wallet, you'll be disappointed here. This is more of a novelty item, but it serves its function nonetheless. As an avid fan of Toy Story, this was a must have for me and I'm glad to have it as part of my collection. This is currently sold out again just about everywhere, but keep a look out on sites like Wicked Clothes, Cake Worthy and eBay . 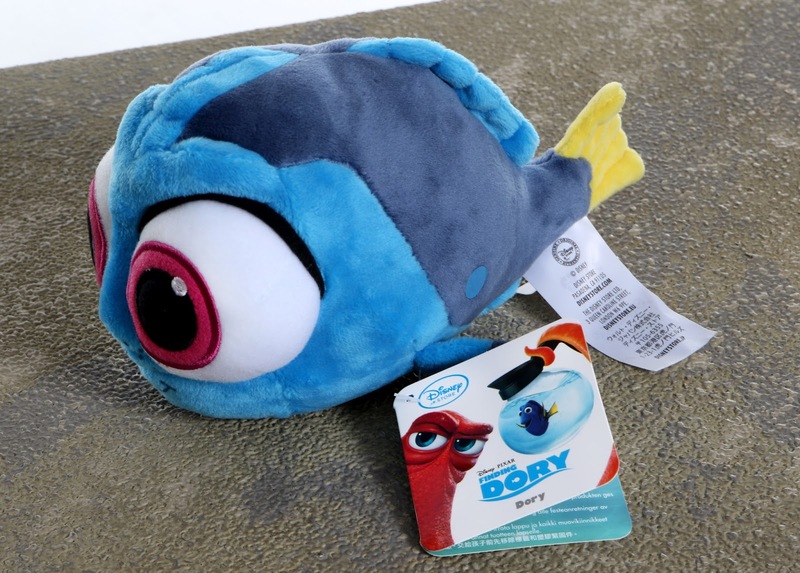 This was available at the Science of Pixar exhibit for a short time last year as well, so be sure to check there if you have the opportunity to go. Best of luck on the hunt! 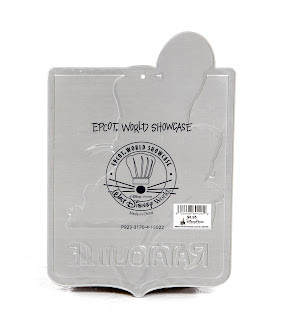 During our visit to Walt Disney World this past April, I was excited to check out the Souvenirs de France gift shop (at the Epcot World Showcase France pavilion) for their latest selection of exclusive Ratatouille merch. I couldn't resist most of the items there, one of which being this pretty neat metal plaque featuring Remy, Chef Gusteau, Linguini and more from the film's main cast. 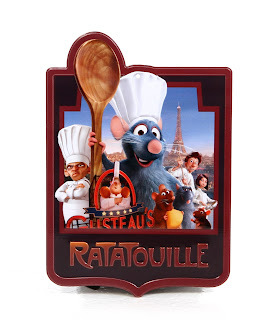 Since this was originally available in Disneyland Paris, there is also a little unknown rat on the bottom right corner who I think has something to do with the attraction there. This is a lightweight, aluminum sign (5.58" W x 8.45" H) with a retail price of $8.95. 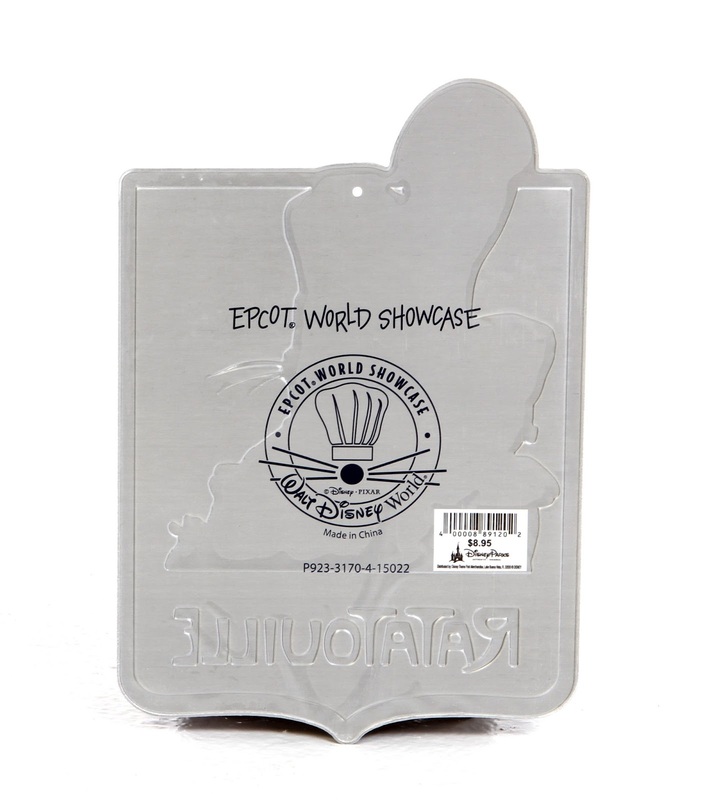 The Epcot World Showcase logo is printed on the back and a nail hole near the top makes for easy wall hanging. I thought this was pretty cute and I'm excited to display it among the rest of my Ratatouille collection. If you're interested in getting this yourself, be sure to pick it up during your next visit to Walt Disney World or order it through the Shop Disney Parks app. SPOILER WARNING for those who have not seen the film. 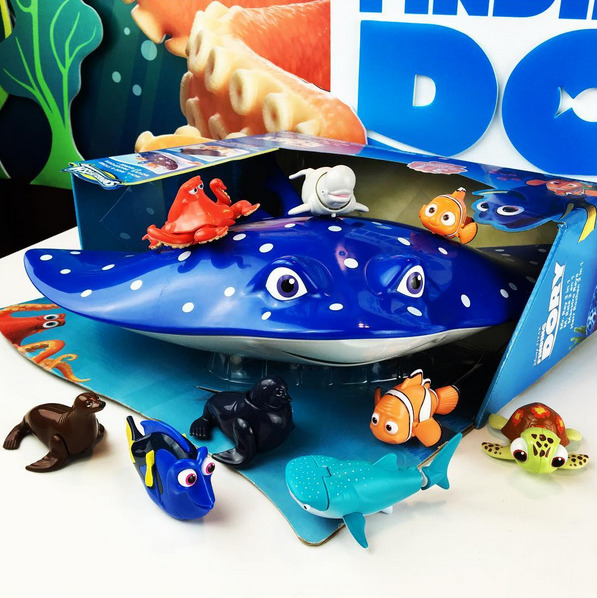 For today's post, we're going to have even more fun with the Finding Dory "Swigglefish" collection from Bandai Toys! 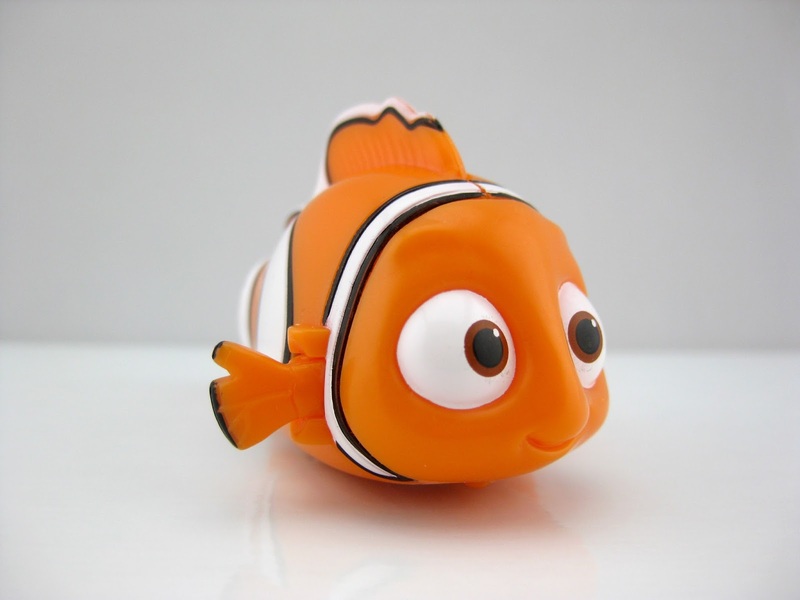 If you missed part one (which is a detailed overview of all the different Swigglefish available and how they work), check it out right HERE. Straight from the crazy, over the top (in the best way possible) climax from the film, here we have the Swigglefish Hank Truck Playset. 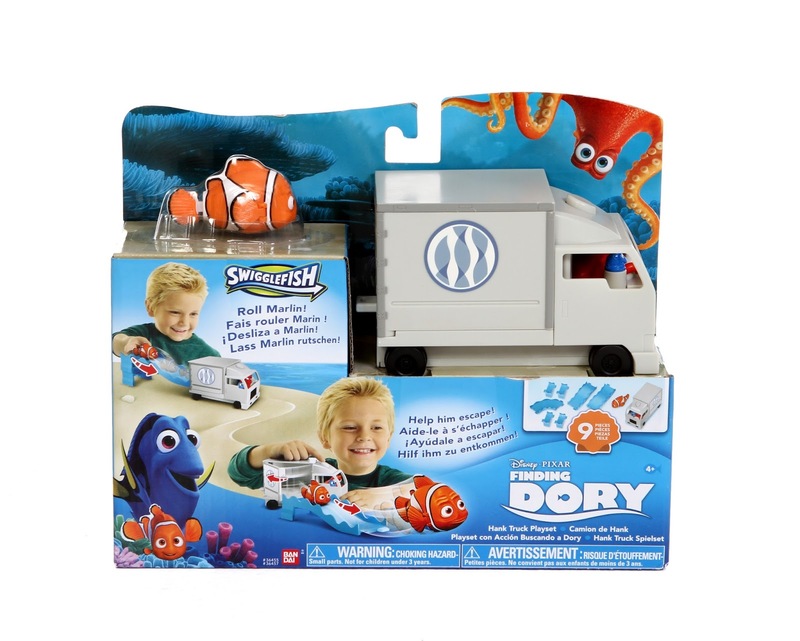 Now kids can recreate the exciting finale when Hank and Dory hijack the Marine Life Institute truck heading to Cleveland. 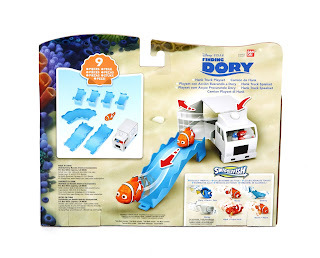 This set comes with seven water track/ramp pieces. After just a couple minutes of assembly, you're ready to roll your Swigglefish down the ramp and right into the truck to help save the day. Once they've "swiggled" in there, press the button on the roof of the truck to release them back into the ocean. "Release, Release! Release, Release!" Retail is $17.99. 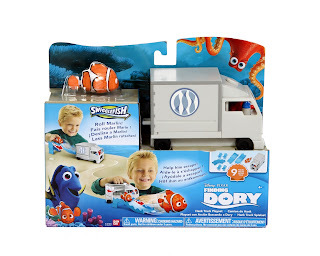 And there you can seen Hank and Dory behind the wheel. Hilarious! This playset comes with one Marlin Swigglefish, who you can also get on a single card for just $6.99. 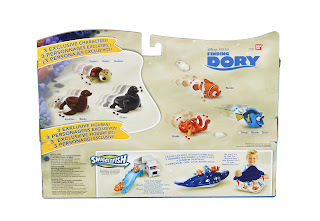 This is already a really fun assortment of figures, but this playset adds a new level of imaginative play. Highly recommended! 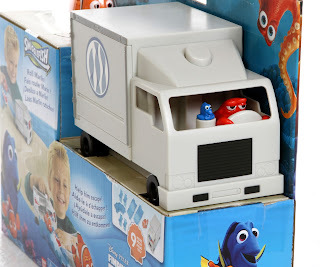 If you're looking to pick this up, you can find the Hank Truck Playset and all the Swigglefish at most mainstream toy stores such as Walmart, Target and Toys R Us. You can also pick it up online using the direct Amazon link below. 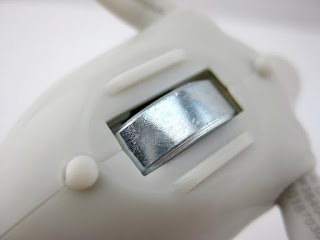 Check out my YouTube video below to see this and all the Swigglefish in action. New from Bandai Toys, here we have this exciting collection of Finding Dory "Swigglefish"! What is a Swigglefish you might ask? Well, these are. 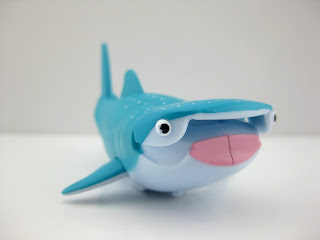 They "swim", they "wiggle"...you get it! 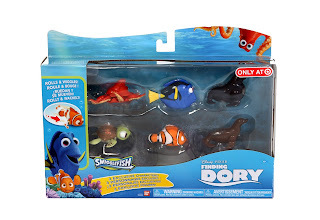 This is a really fun figure assortment, currently featuring nine memorable characters from the hit film: Hank, Dory, Fluke (Target gift set exclusive- more on that below), Squirt (Target gift set exclusive), Nemo, Rudder (Target gift set exclusive), Bailey, Destiny and Marlin. Each character is plastic and about 4" in size. 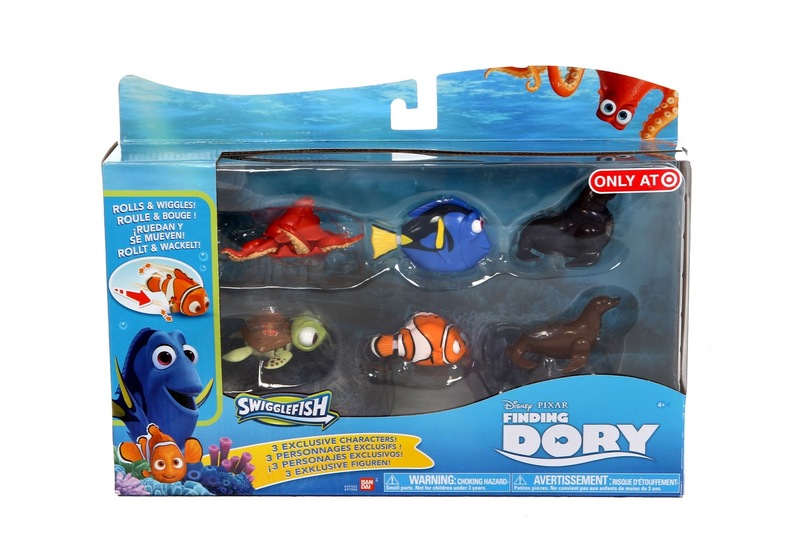 These are the only Finding Dory figures that have "motion outside of the ocean" (As Bandai has stated). 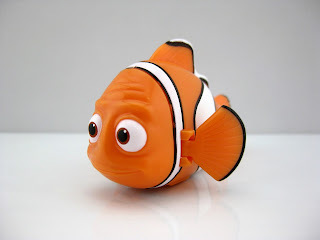 Each "fish" (even though they're not all technically fish) has a wheel underneath which triggers a unique "swimming" movement when the character is rolled along a hard surface. Note- these are not intended for water use. 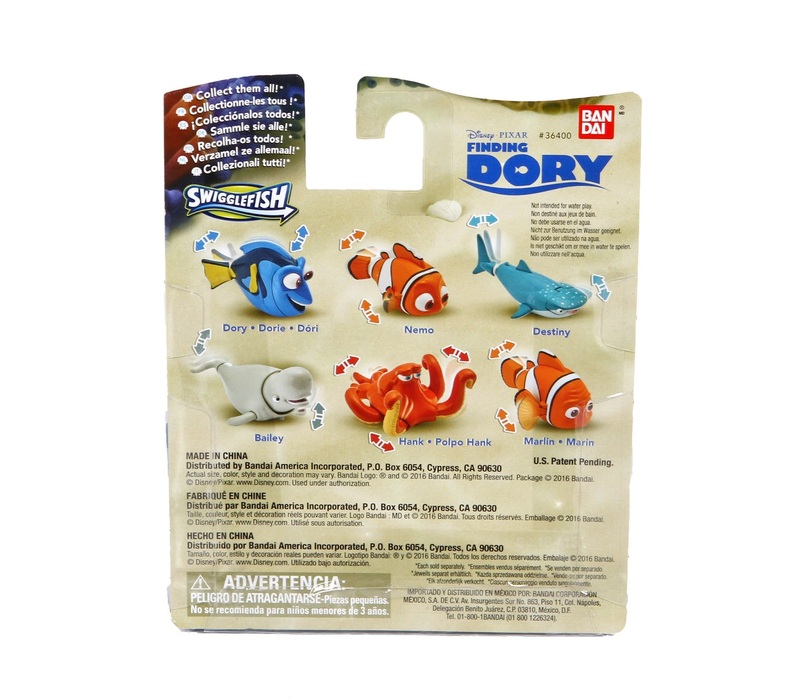 As seen on the back of the package, six of the nine Swigglefish are available individually on their own cards (like the Bailey and Destiny I have here below). 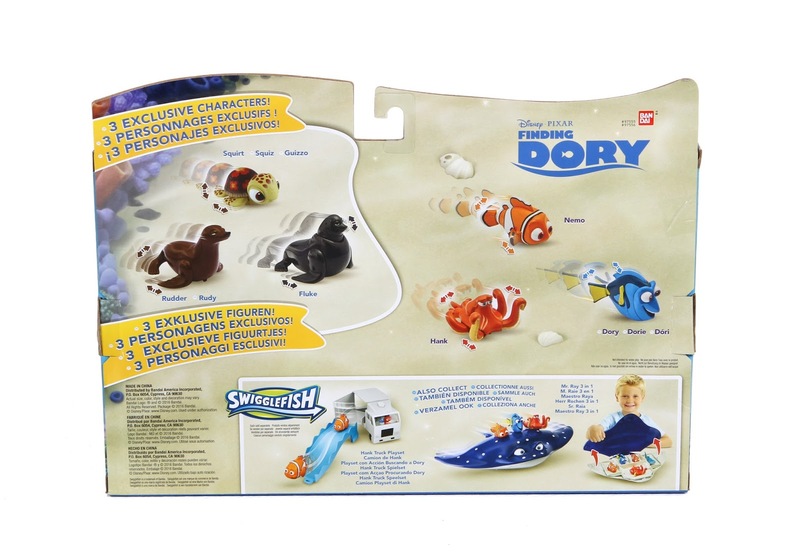 The easiest way to get most of the bunch, plus three exclusive characters, is to pick up this Target gift set. 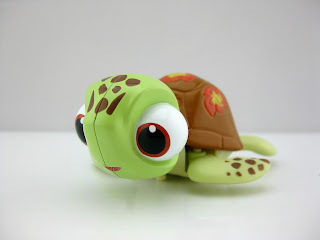 I love that this includes Rudder, Squirt and Fluke! If you're looking to start this collection, I would highly recommend beginning with this set and then getting the remaining figures (Destiny, Bailey and Marlin) individually. 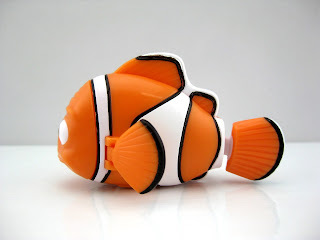 Speaking of Marlin, where is he you might ask? 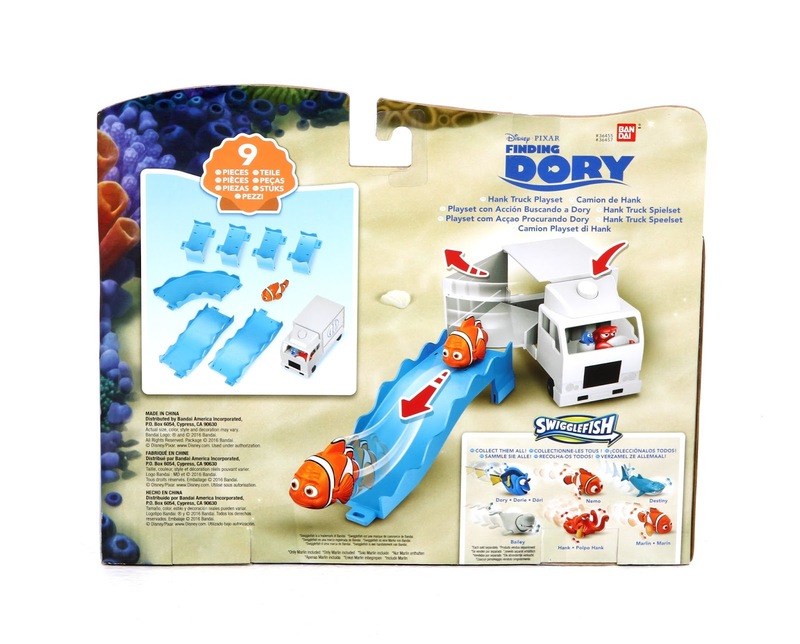 Well he also comes with the Marine Life Institute Hank Truck Playset, which I showed off in PART 2 HERE. Since I already had that, there was no need to get him individually as well. I really love this collection. I think young fans of the movie will have a blast playing with and collecting their favorite characters. It was fun to take them out of the package and test each one's unique movement (which I'll be showing soon in an upcoming YouTube video). 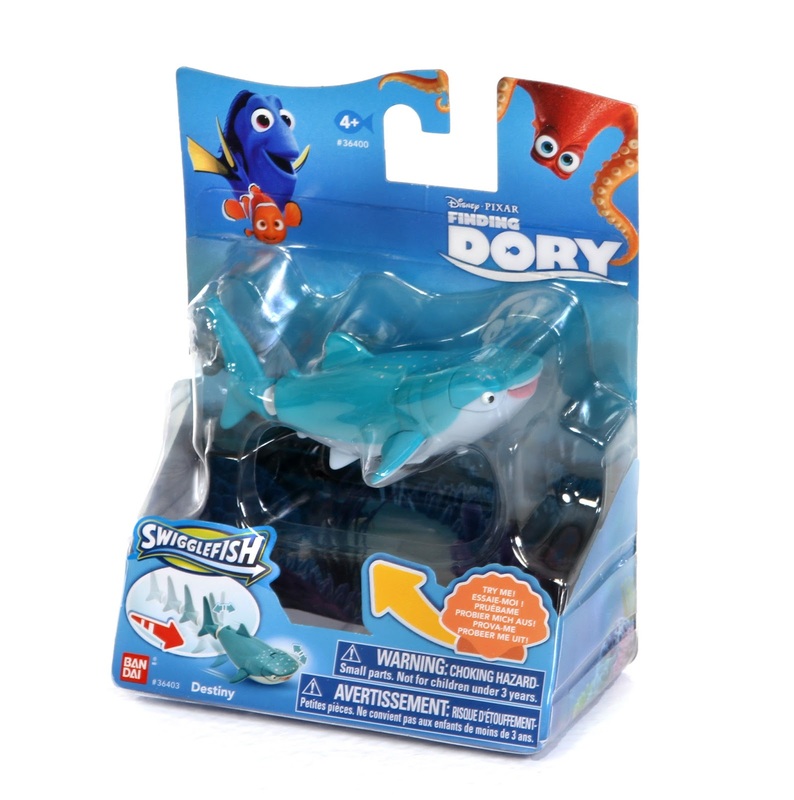 You can find them at really any mainstream toy store such as Walmart, Toys R Us and Target. According to Bandai, there will be 18 Swigglefish figures launched in 2016 (I'm not sure if that includes the three Target exclusives or not); so look for more later on this year! Stay tuned right here for additional sets soon. A big thanks to Bandai Toys for sending some of these over! They're looking great. UPDATE- My YouTube video is now up! Check it out below to see these and all the corresponding sets in action. "Hi. I'm Dory. I suffer from short term remememberly loss. I like sand. Sand is squishy." Baby Dory (or toddler Dory), as seen in Finding Dory, might just be the cutest thing you see on screen all year. Her big eyes, her adorable little voice... I mean, come on. Even movie goers with the hardest of hearts were no doubt softened by her appearance. I'm sure many people walked away from the film wishing they could have a little Dory of their own to bring home with them. Well I have good news! Now you can. 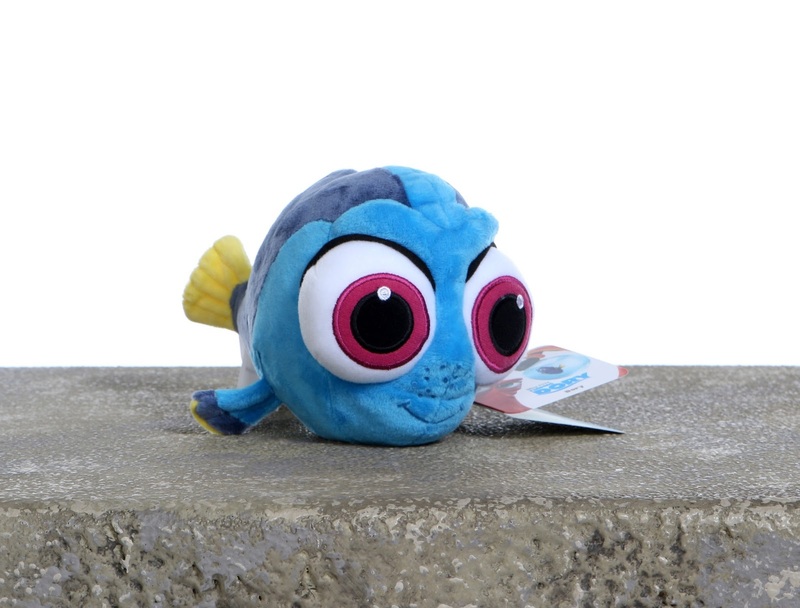 Available as of today exclusively at the Disney Store, here we have this "fin"tastic baby Dory mini bean bag plush. 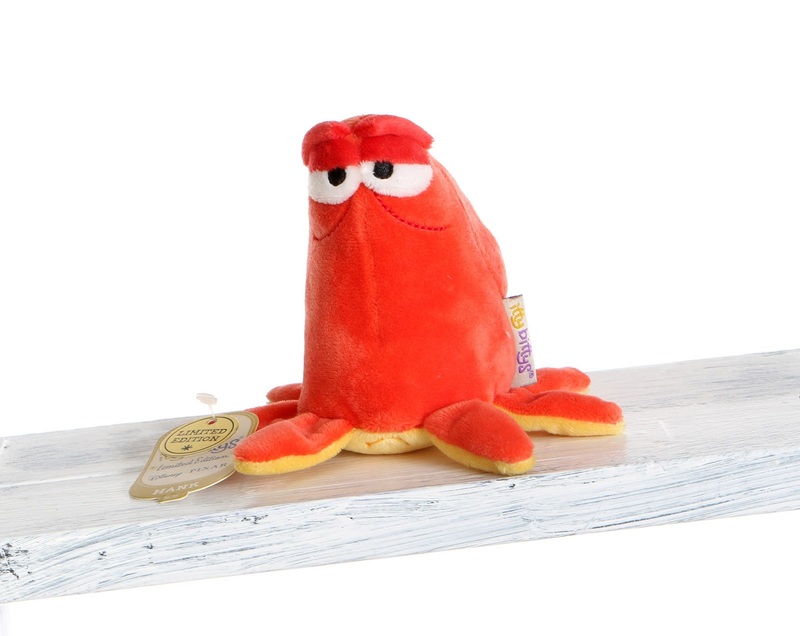 This is a wonderfully crafted, very soft plush with embroidered features and a pretty nice likeness to the character. She really is a cute as can be. 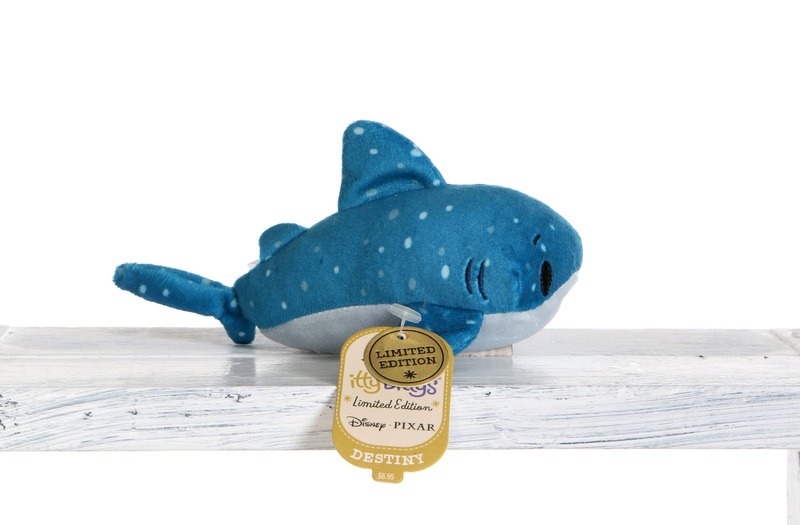 She measures about 8" in length and retails for $9.95. 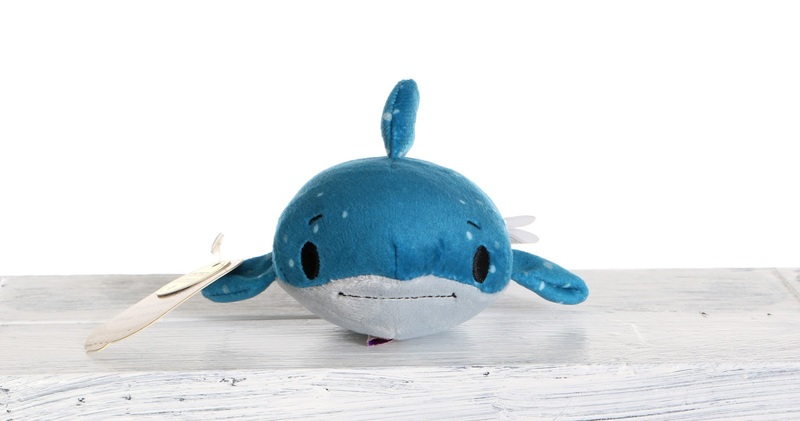 I work at the Disney Store and I can tell you right now that this will be one of the most popular plushes ever. Today alone we sold an unfathomable amount of these; people walking by just couldn't resist! One lady even bought like 15 of them (no joke). 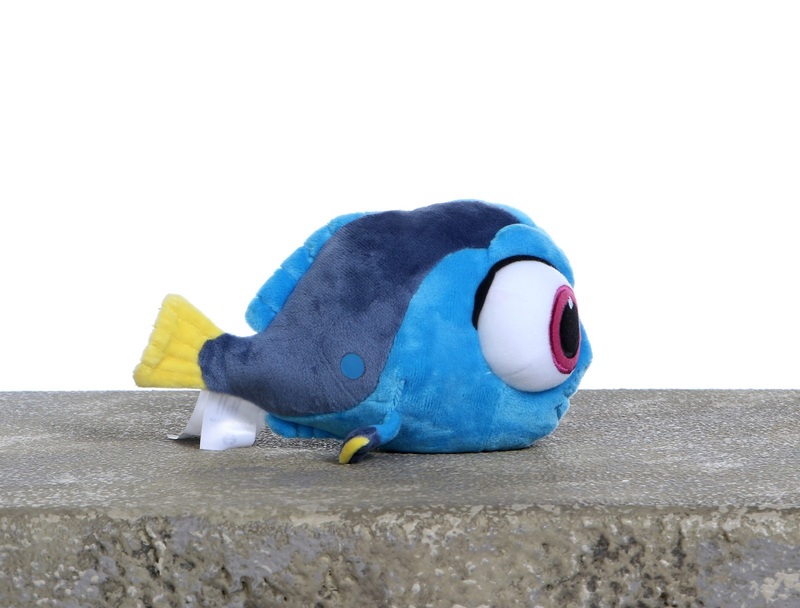 Don't be like Dory and forget about this one until it's too late. 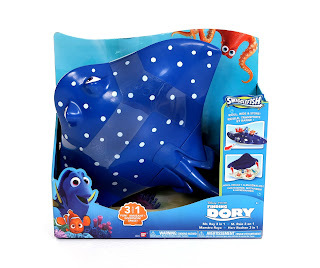 Be sure to swim over to your local Disney Store (or online HERE) and get yours today. 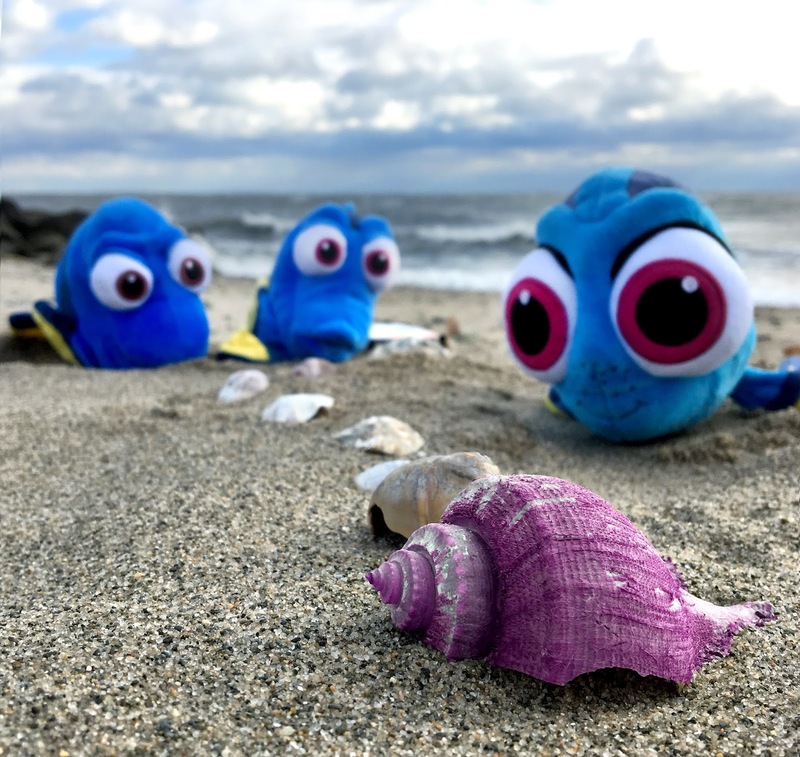 Also, if you'd like to witness the cuteness over and over again (while you wait for the Blu-Ray), check out THIS clip released by the official Disney·Pixar YouTube channel. 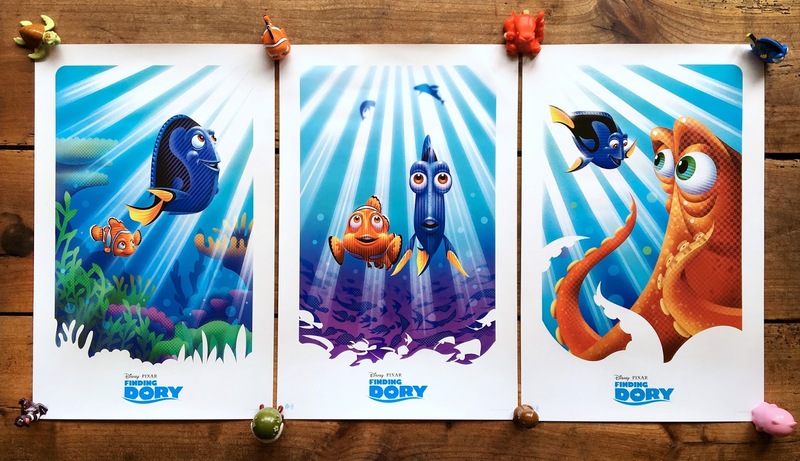 There's no denying that much of the heart and soul of any Pixar film lies within the music. Though the images on screen are powerful and beautiful on their own, the music adds an emotional depth and fun that ties everything (the animation, the voice acting, the sounds, etc.) together. 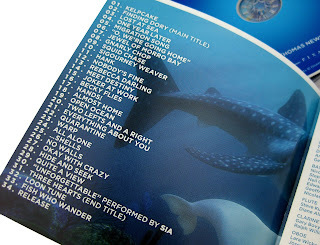 I look forward to Pixar soundtrack releases like no other, so needless to say I was greatly anticipating Finding Dory. I love what composer Thomas Newman did with Finding Nemo and Wall·E and I was excited to hear what he came up with this time around. Over the past few days, I've been listening to this soundtrack and really internalizing it. 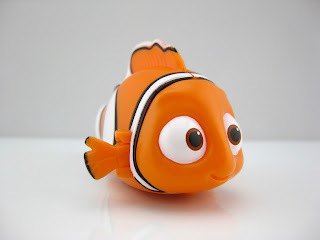 During my initial listen, I was a little disappointed that there wasn't a melody/theme that was as instantly iconic as the original Nemo theme. After multiple listens, I still feel that this is the first time a Pixar score hasn't included a main theme that I can hum or whistle. However, I've come to the conclusion that this is a stunningly beautiful score regardless. I honestly can't stop listening to it. 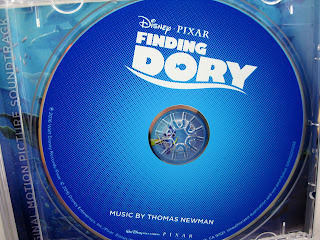 This score has an incredibly unique and diverse flavor to it, though it's still very much Thomas Newman's signature style. Like the film itself, some cues are sad and tragic, some are cute and heartfelt and some are just downright fun (and, surprisingly, very "spy film-esque"). Much of it is actually quite soothing and tranquil, while you also have some great action set pieces. You'll find a fantastic combination of orchestra, electronic instruments/sounds and choir. 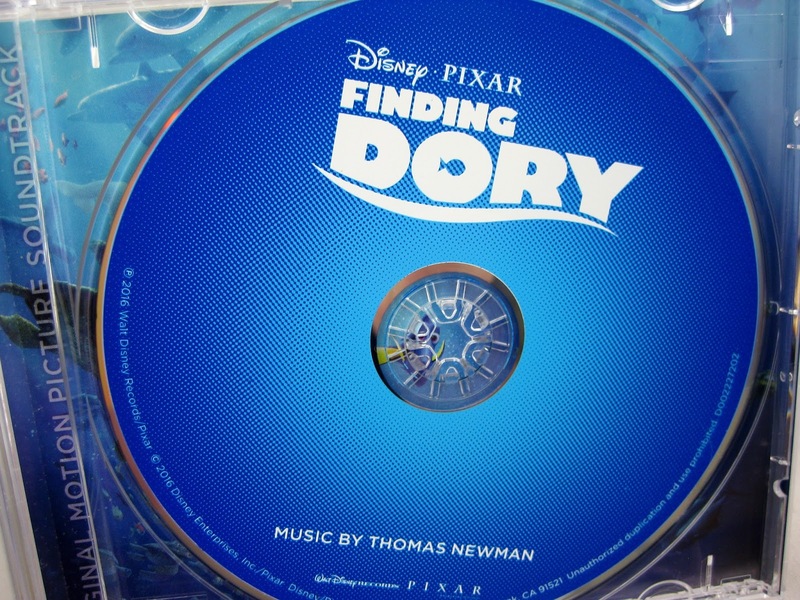 If you're a follower of Thomas Newman scores as I am, you'll probably recognize that some of the tracks feel very much like a combination of his previous works (in terms of style). I couldn't help but notice some tracks felt very reminiscent of the work he did on A Series of Unfortunate Events, Saving Mr. Banks, Bridge of Spies and 007: Spectre (among others). The easiest example I can pull up is this; listen to the very beginning of THIS track from Bridge of Spies and THIS track from Finding Dory. ;) It's not a bad thing, but being a film score buff, I notice these things. Track 2- "Finding Dory Main Titles"
Track 29- "Quite a View"
I also have to mention "Unforgettable" preformed by Sia. This is a cover of the classic song made famous by singer Nat King Cole in 1951. When I first saw the live performance on the Ellen DeGeneres show, I was mostly disappointed with it. I didn't love the rendition. Fortunately, the album version is much better and I've actually grown quite fond of it (especially now having seen how the tone of it fits in with the end credits of the film). Now this is a song that will get stuck in your head. 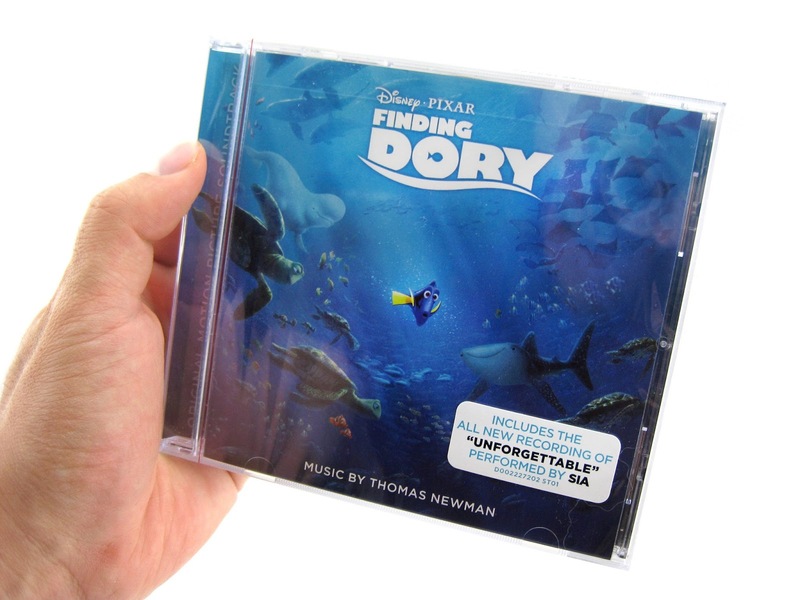 The bottom line: Though perhaps not littered with as many memorable themes as its predecessor, I'm actually going to surprise myself and say that I actually enjoy listening to this score all the way through (from beginning to end) more than Finding Nemo. It's the overall feel of this score, more than the memorability of the themes, that has won me over. 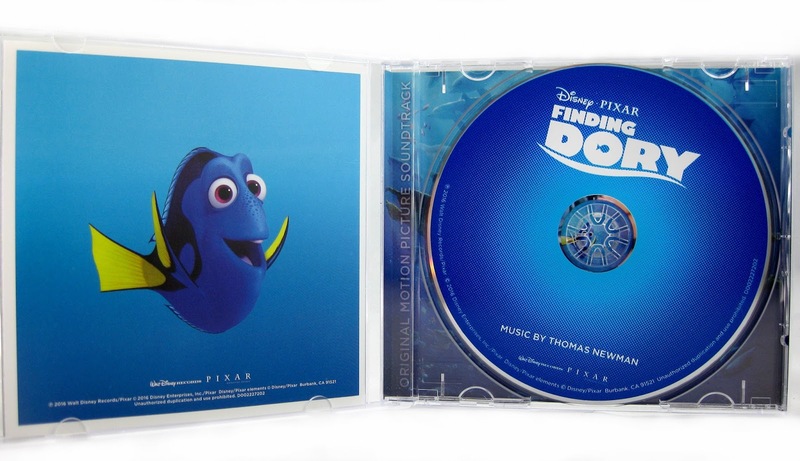 And having seen Finding Dory three times now, I could not imagine the music matching more perfectly with the visuals than what Thomas Newman has created here. From Cars 2, here we have Jesse Haulander- yet another brand new 1:55 scale diecast release from Mattel! 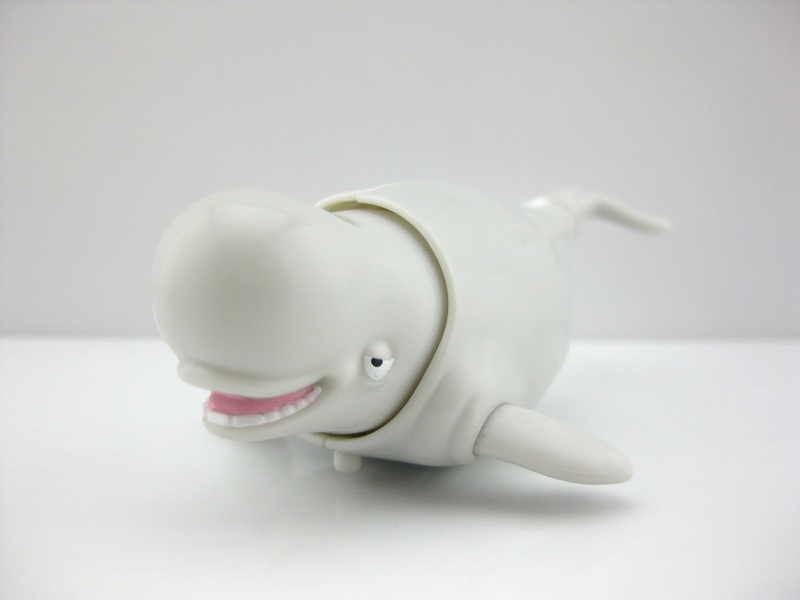 He has just hit shelves as part of the 2016 "Cruisin' Tokyo" sub-series (#5/9). As shown in the screenshot above, Jesse is a background character briefly seen during (what I call) the "arrival to Tokyo montage." Literally, if you blink you'll miss him. 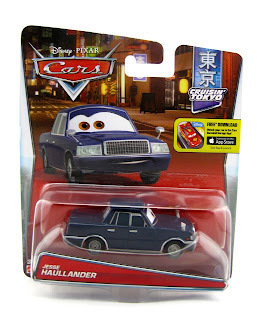 I wonder how Mattel comes up with what characters to create out of the thousands of background cars on screen? 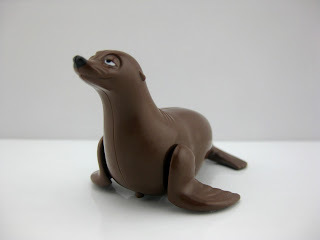 You can find this one in stores now (I just found him at Target a couple weeks back), or be sure to snag him online by visiting eBay HERE or Amazon using the link below. Best of luck on the hunt! 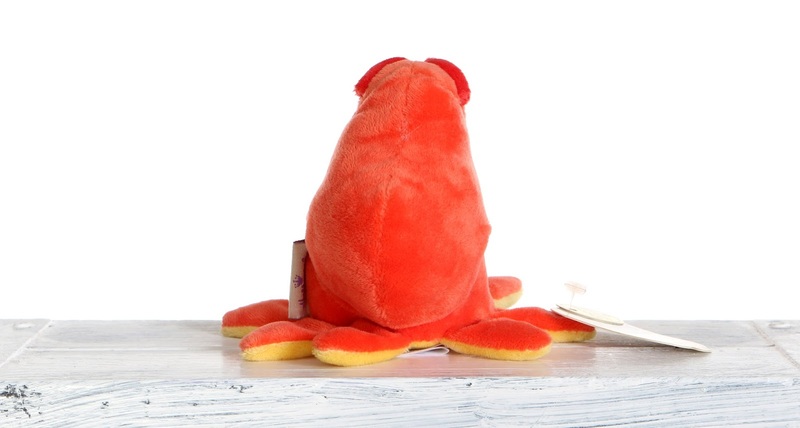 In early 2014, Hallmark stores released an exclusive collection of adorable mini stylized plush called "Itty Bittys" (based on a wide variety of popular characters from Disney, Pixar, and so on). 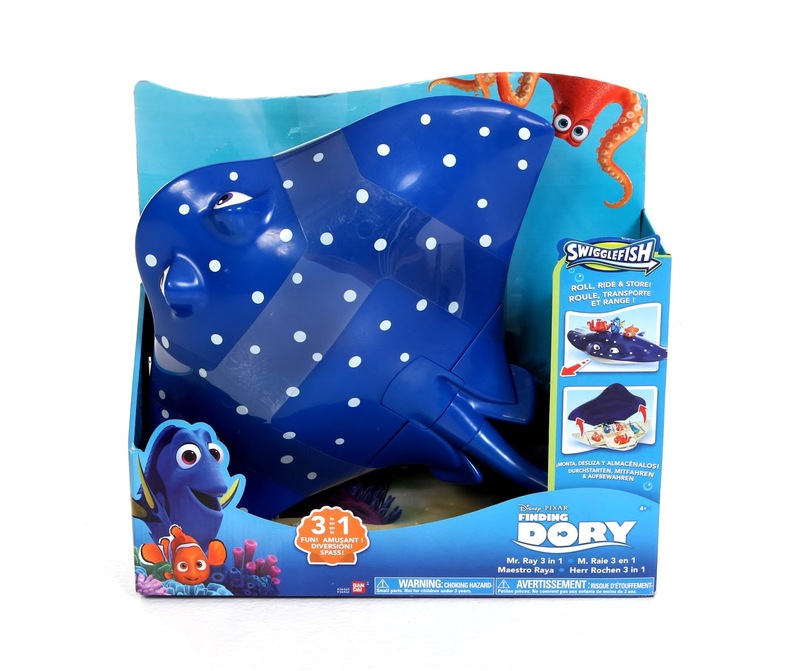 Fortunately, since I was hoping they would, some characters from Finding Dory have just hit shelves...Destiny (the near sighted whale shark) and Hank (the seven armed octopus)! 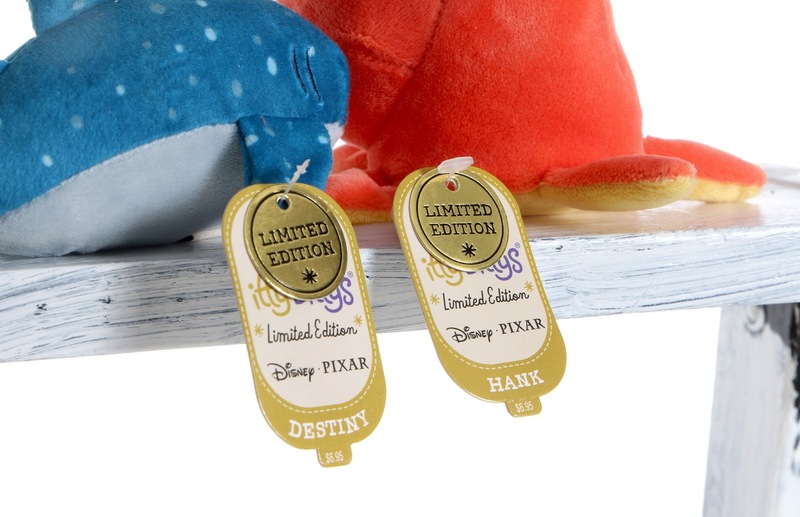 These are both labeled as limited editions, though I'm not sure exactly how many were made. Each Itty Bitty is about 3" W x 4" H and retails for $6.95. They are quality made with super soft and vibrant materials and have some great detailing- not to mention how cute the overall designs are! Check them out in more detail below. The very first Pixar Itty Bitty characters released were Mike and Sulley. Nemo & Dory, Buzz & Woody, Merida and the emotions from Inside Out soon followed. 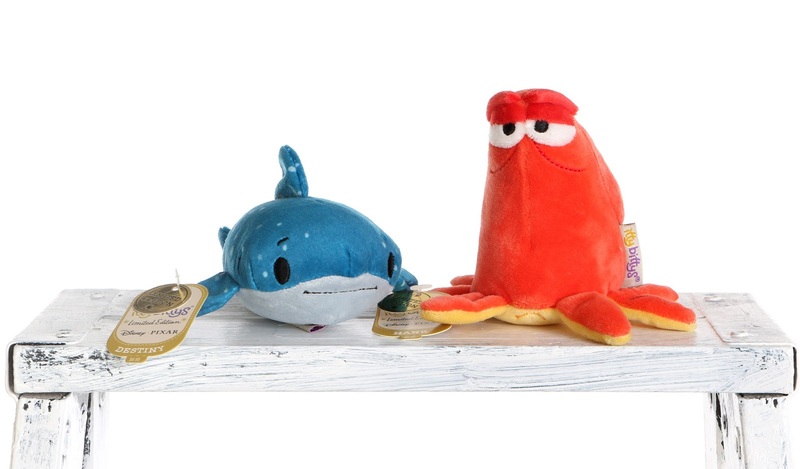 If you're a fan of Disney and/or a variety of other franchises, be sure to check out the large selection of Itty Bittys at Hallmark. 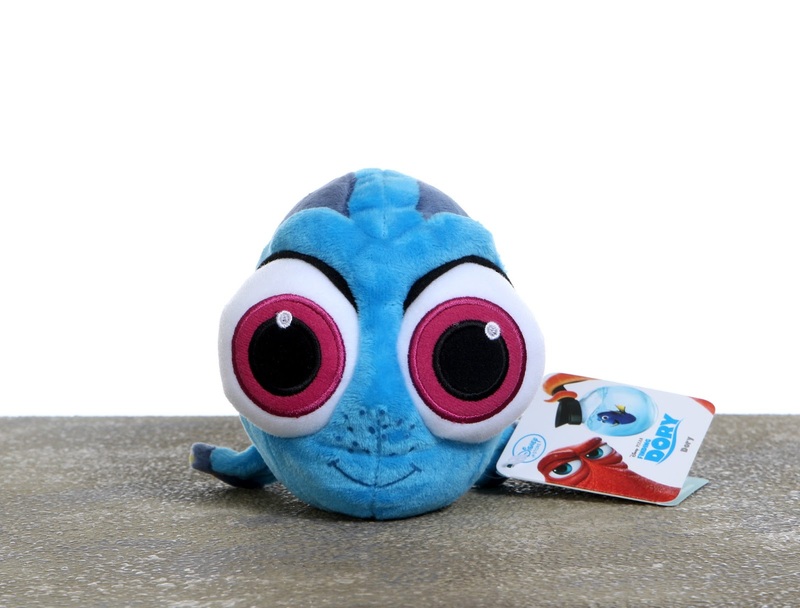 There are a lot of fun characters to collect from classic Disney, Disney princesses, Disney Junior, Pixar, DC and Marvel super heroes, Frozen, Dr. Seuss, Star Wars, Muppets, Scooby-Doo, Winnie the Pooh, Peanuts, Wizard of Oz and so on. Many new releases are slated for 2016, though I believe these two are the only Pixar characters on the docket. 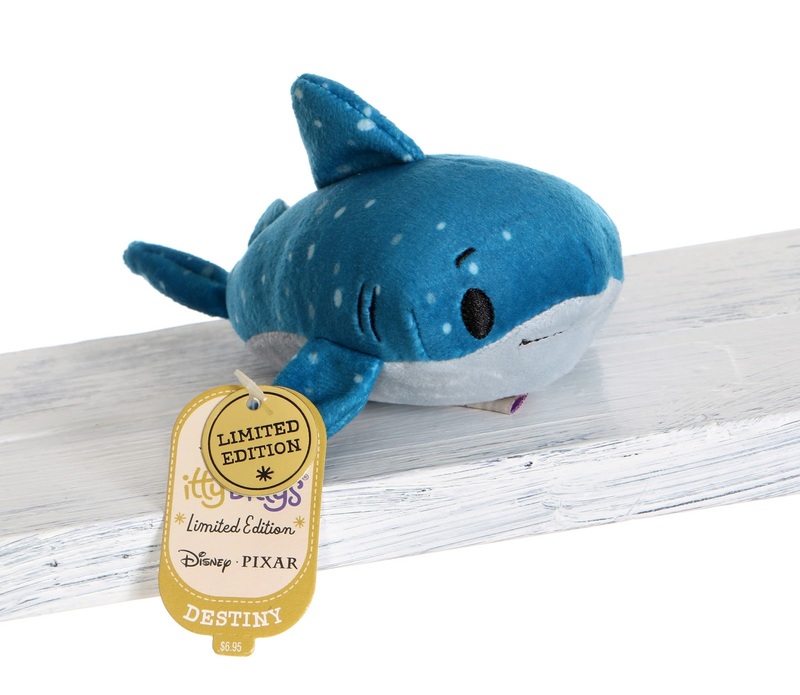 If you're looking to add these fishy friends to your collection, they are currently available in stores or online (HERE for Destiny, HERE for Hank). I was able to find them at my local Hallmark this past week. Which Pixar Itty Bitty characters would you like to see released? Shout it out in the comments below!